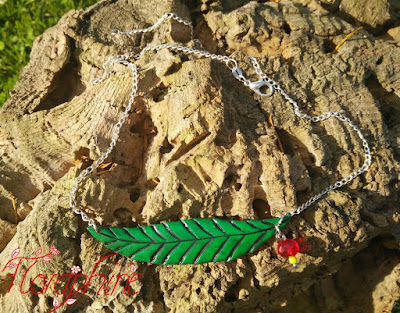 Today I want to show you how you can make a very simple leaf necklace that is perfect for summer and looks really pretty. I got the inspiration from a dress I have that has really nice flowers and leaves. Roll out clay in the colour you want your leaf to be. I mixed a dark green to go with my dress but of course you can make it any shade you like. Don't make the clay sheet too thin. Trace a leaf on there with a needle tool or toothpick. Then cut out your leaf shape. 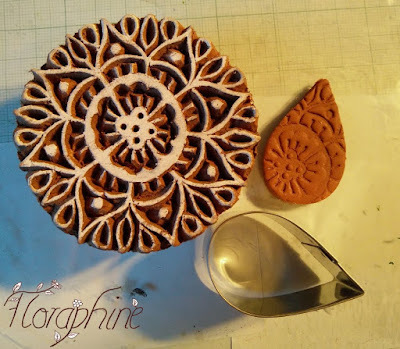 You can definitely use a cookie cutter for this but simply cutting it by hand works fine. If you have a bendable blade, use that. Make sure you round off the edges really well with your fingers to give it a natural look. Now onto the veins. Use a needle tool or toothpick to make indents in the clay for the veins. You can trace them first if you're unsure. Then deepen them slowly to get them accurate. You can make them as detailed as you like, I stuck to a very simple design to match my dress. Smooth out any lines you don't want there with your fingers. If you have difficulties removing them, use a little bit of liquid clay or even water on your finger. Now just make some holes in each end of the leaf to hang it later. You can also drill the holes after baking if you like the look of more accurate holes. This way you don't risk distorting your design, too. However, if you don't have a hand drill, make the holes prior to baking. Then bake your leaf according to the instructions on your clay package. After baking we can add some paint into the crevasses to make it more interesting. I chose black paint but you can use any colour you like. You can experiment until you like the look. Thin out your paint with water and brush it on the leaf, making sure you cover all the little deep spots you have created. Let the paint dry a bit and then rub off the excess from the high parts with a baby wipe or a q-tip with alcohol. If you rub off too much, you can always fix this with more paint. Then varnish the leaf to protect the paint and that's it. To make it more interesting, you can add some beads. For this you'll need a head pin. Put the beads in the colour and size of your choice on your head pin and bend a loop at its end with round nose pliers. You might need to cut the excess wire. If you do need to cut anything, I recommend filing away any sharp edges with a nail file so you don't poke yourself when wearing the piece. 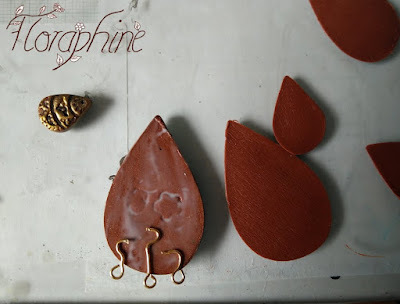 Attach a jump ring on either side of the leaf by carefully twisting the open ends of the jump ring with pliers. Never pull open any loops of metal, always twist! Measure how long you want your chain around your neck and then open up the little rings in the right place. 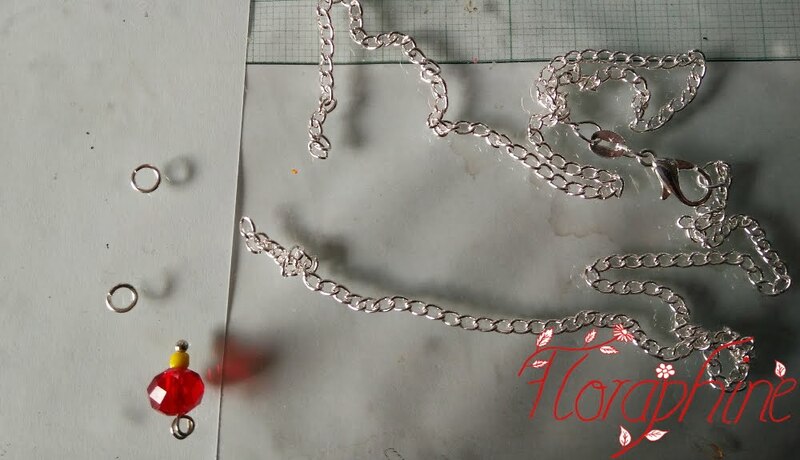 Attach the chain to your jump rings and add a lobster clasp and a jump ring as closure if necessary. 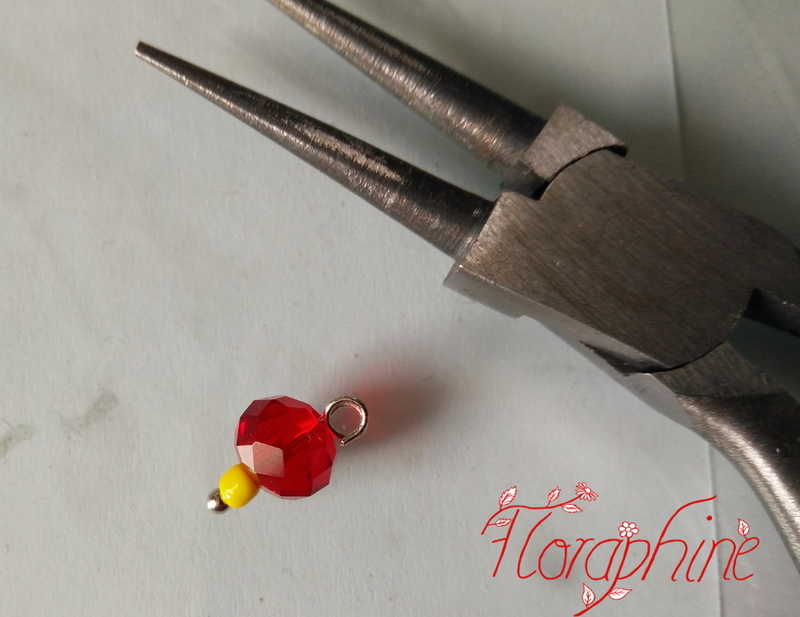 To add your head pin, put it on the jump ring with its loop and twist it shut. I hope you liked this easy tutorial. Let me know what you think and if you have any questions. 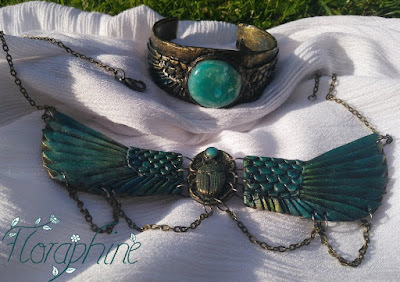 Today I want to show you how I made an Egyptian jewellery set inspired by ancient jewellery I saw in the British Museum in London. It contains a winged scarab which resembled the sun god Ra. 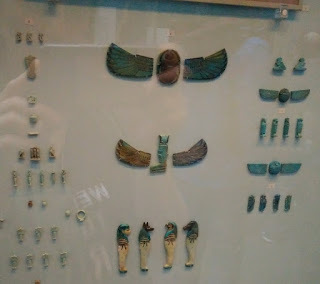 So here is the photo I took of the Egyptian jewellery of the British Museum... I know it's horrible. However, I found a link to a better photo on Flickr. On the base of these photos I started by making a sketch of my design: The scarab in the middle, surrounded by an oval. For the oval I used my oval cutter as a template as I was going to use it later. Then draw an abstract wing shape next to it. You can divide it into more parts if you like. Decide where you want to have the holes. I stuck to the photos I had where I could see a lot of holes. 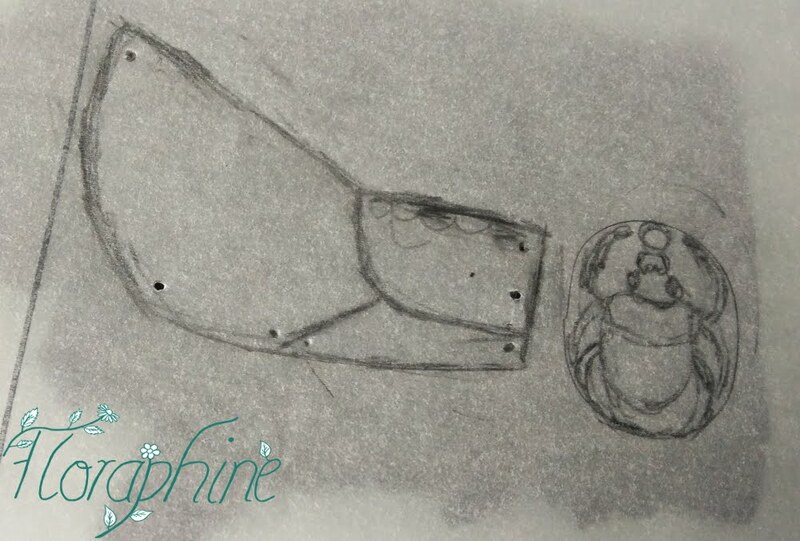 After you have made your basic sketch, you can trace neatly it onto some parchment paper to make it easier to transfer to the clay. 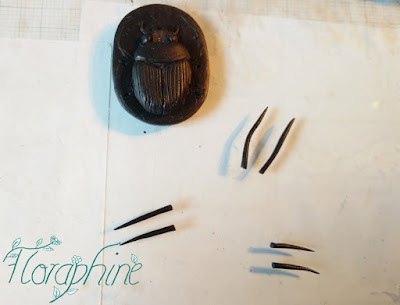 Now roll out a sheet of clay (I used black to achieve an aged finish later, but you can us brown or gold or whatever you like) and transfer your sketch to it. Simply put your paper upside down on the clay and rub. The graphite from the pencil should transfer to it. If it doesn't, trace over it with a pencil. 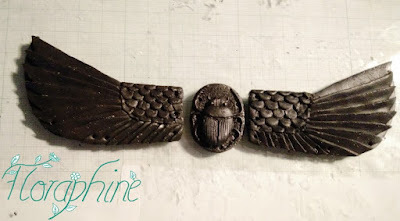 Do one oval for the scarab and one wing and then turn it around to trace one opposite wing. Then cut out your pieces. 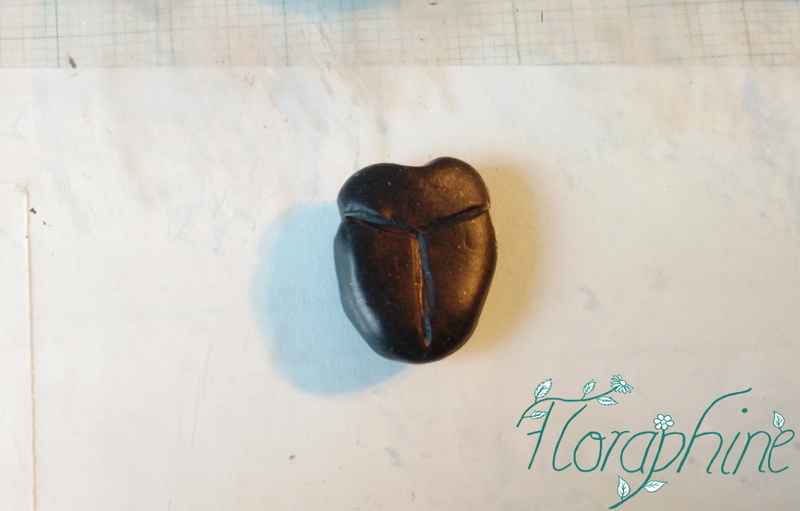 I cut out my scarab piece with a cookie cutter but of course you cut it by hand. Also make the holes where they should go. Here are all three pieces, positioned how they will be assembled later. Now some details. 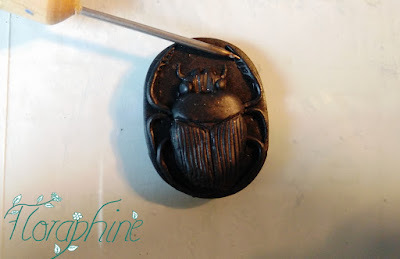 First we'll make the scarab. Take a piece of clay and roll it into a ball first. Then slightly roll it into an oval and flatten it a bit. 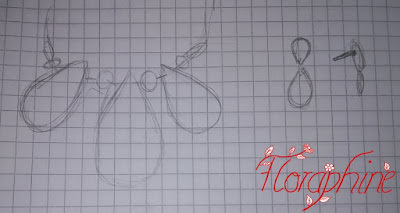 Check if it fits by placing it on your sketch. This way you make sure, you don't lose the dimensions. 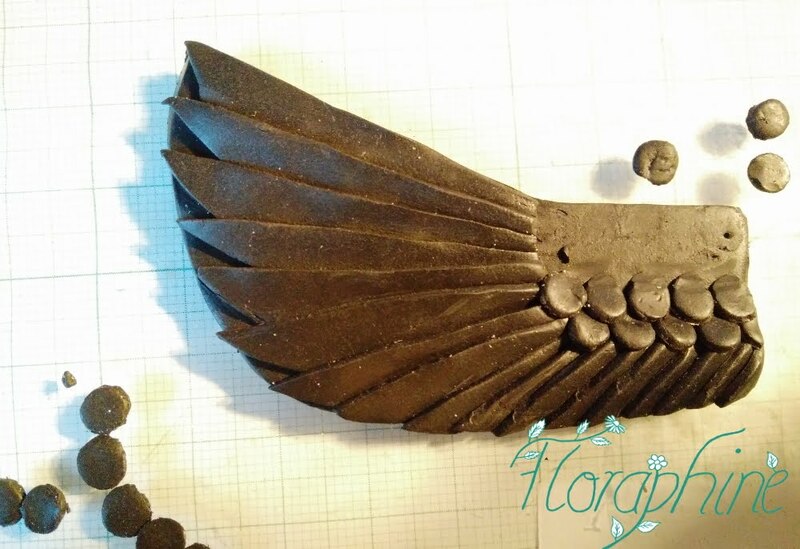 Trace the closed wings and that part above them with a needle tool and slightly indent it at the top. Put the body on your oval. Now we make the head. It looks harder than it is. Basically, you cut out a little half circle and cut out four spikes, too longer ones in the middle and two shorter ones at the sides. Smooth out any sharp edges. Don't forget to check your proportions by laying it on your sketch. Now just roll two little balls of clay and attach them as the eyes. Also roll a really thin snake of clay. Attach the head to the body of the bug. You can add some texture by making lines on the body and head with a needle tool or toothpick. 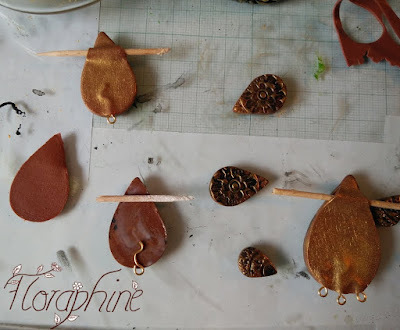 From the thin snake of clay, cut pieces for the legs and antennas. For the antennas we'll just need some very small pieces, make sure they're pointy at the ends. I also left some space to add a bead later for the scarab to hold. To measure the length of your legs, lay them on your piece or sketch to get the right size. Then cut the excess, bend them into legs and attach them to your bug. As you can see, I needed long legs, medium and small ones, but it it really depends on your piece. Now we want to make the legs more scarab-like. Take a needle tool (or a toothpick) and at an angle drag some lines starting from the legs outwards (see photo). Do this with all of the legs. Now we move on to the wings. You can make the feather-like shapes different ways but for me this was the easiest method. First roll out a sheet of clay at a medium thickness and then cut strips that are thicker on one side and thinner on the other. Hold your blade at an angle to do this. Then change the angle to get alternating strips - one time having the thick part in the left, the next time on the right. 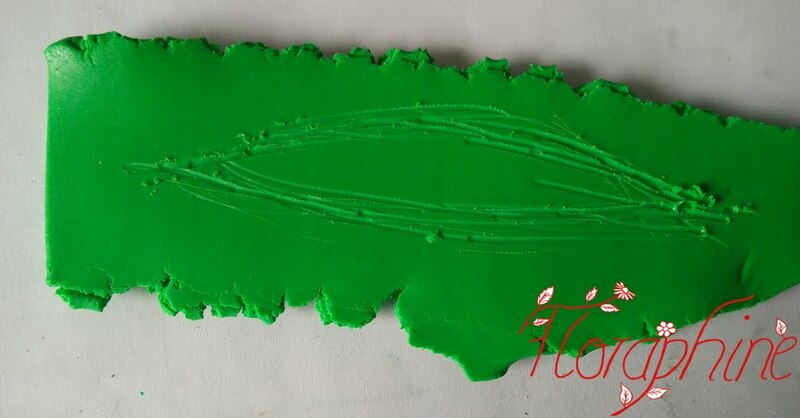 Now everywhere you have a thick side, cut the clay at an angle again to obtain a half feather. Leave the other side for now. Now start placing your feathers on the wings. 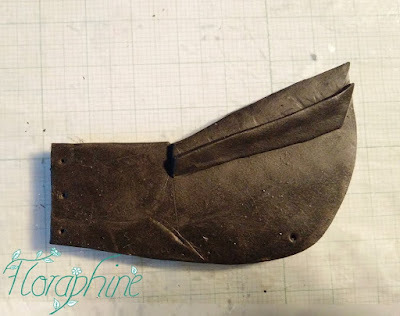 It's crucial that you start at the top an outer edge (see photo) if you want to imitate this exact design, as all the other pieces will overlap the first. So position your first feather with the thin end over the outer border. Then cut your excess. As you can see, I traced this rounded shape on the inside of the wing following my reference photos. This will be covered with different feathers. Position your next large feather overlapping the first slightly and continue until you have this part covered. You'll have to cut the pieces smaller and smaller the more you move to the bottom. Try to match the other wing by counting your feathers and checking now and then if they're more or less symmetrical. But don't worry too much about it. It's art. Enjoy the process. For the small feathers in the middle sections I cut out very small circles using the smallest size of my homemade circle cutters. Check out the tutorial here. Then start at the bottom and place row after row of small feathers on your wing. This is what the project should look afterwards. 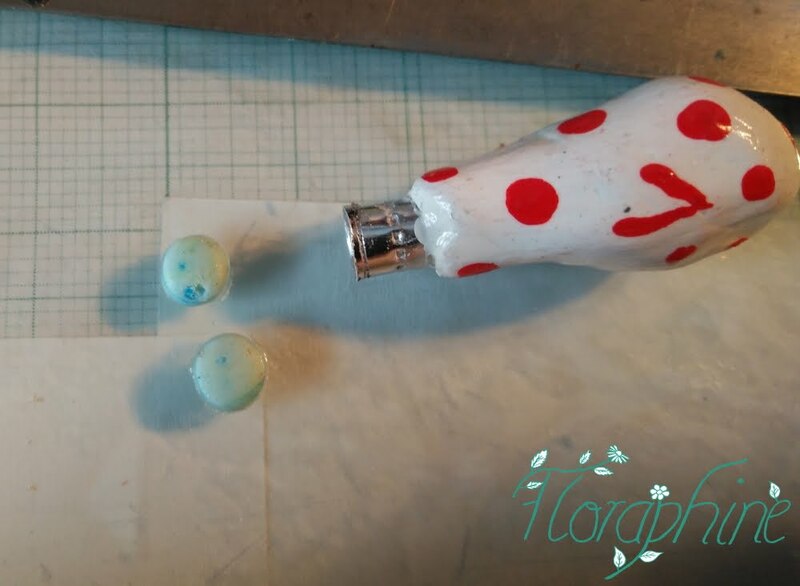 You can add some texture by crushing a piece of aluminium foil into an irregular ball and carefully dabbing it onto some areas of the necklace pieces. This gives it an aged and worn look once you add colour. You can also make fine cuts with your knife as texture. But don't overdo it. 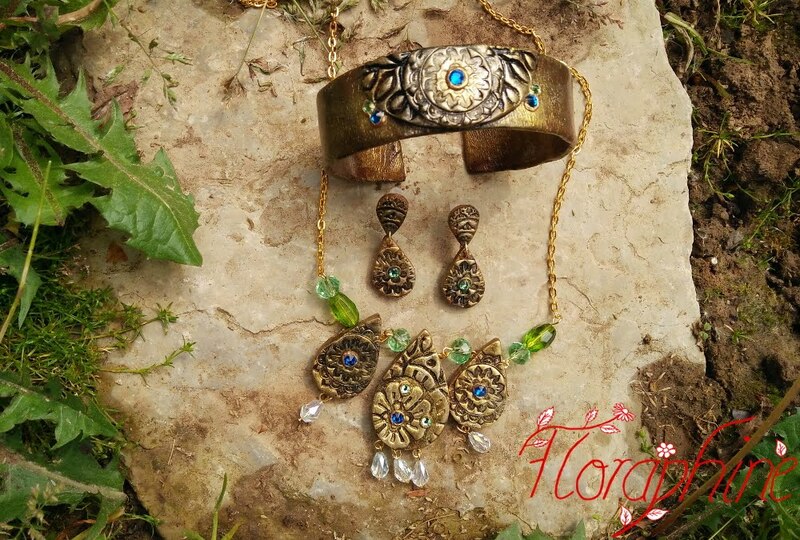 Before applying any colours, we'll create a matching bracelet. 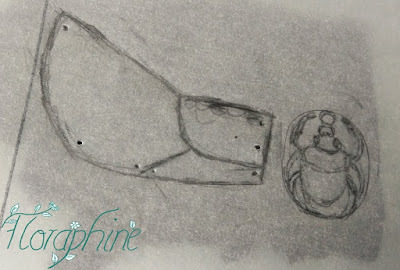 First draw out a shape you want your bangle to be. I chose to make it larger in the middle. Make sure you measure your wrist to know how long your strip has to be. After you have the basic shape, fold it in half, correct any irregularities and cut it out folded, so that it is symmetrical. 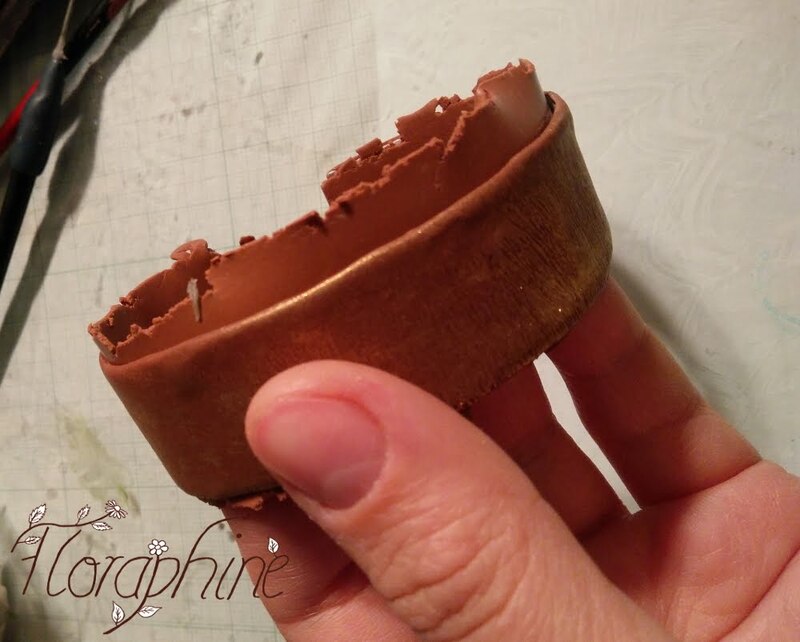 You can either just make your bangle from clay or put a sheet of metal in the middle to make it sturdier. For example you can use soda can metal. 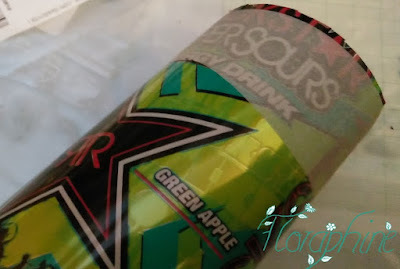 In order to do this, cut open your can and tape your template to it. Trace it and then cut out the shape. 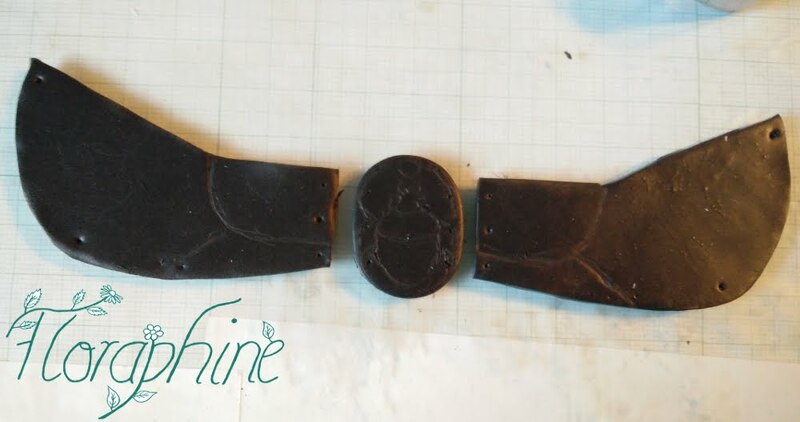 Now we make a pretty stone as centrepiece of the bangle and a small one for the necklace. 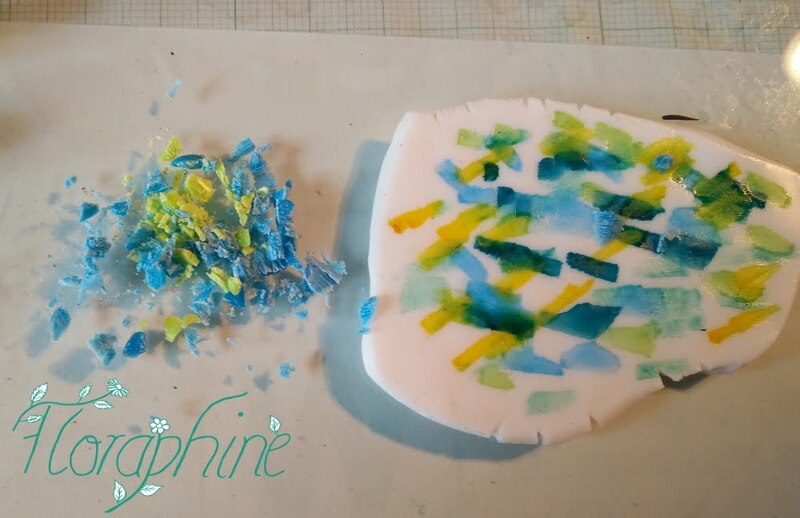 For this, roll out some translucent clay, apply alcohol ink to the sheet in the colours of your choice (I don't have bottled ink so I dabbed on colour with my alcohol markers) and then with your blade shave of some wax from corresponding crayons. 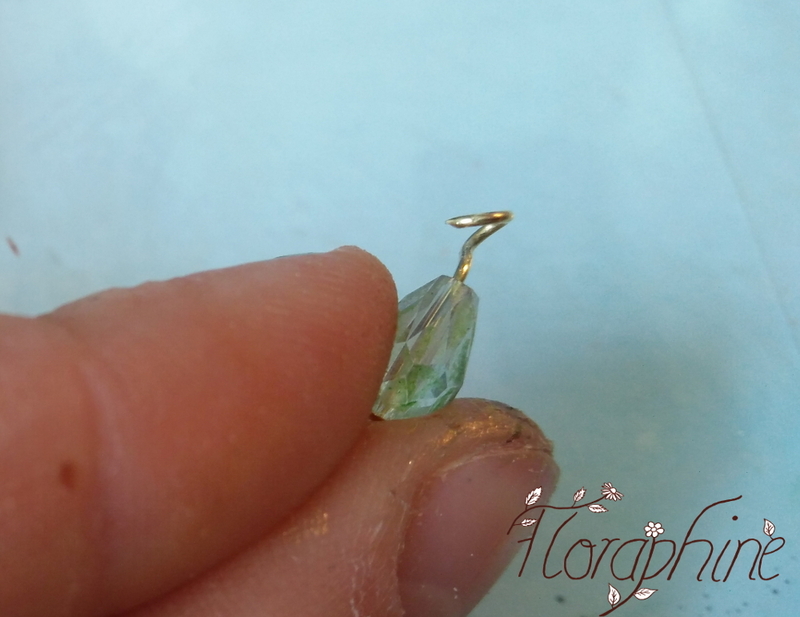 These little pieces make really nice inclusions in your clay. Put them on your clay sheet, fold this and roll it out again. You can repeat the ink/crayon process but remember that the more colour you put in, the more you lose the transparency. Mix your clay until you have achieved your desired patterns and colours and then roll it into a sheet again. For the necklace we need a very small stone for the scarab to hold. For this, either take your smallest round cutter or try to cut it by hand. Round of the edges with your fingers. To give it more dimension, roll out a sheet of translucent clay as thin as possible and carefully lay it on top of your stone. Cut around and smooth out any irregularities with your fingers. 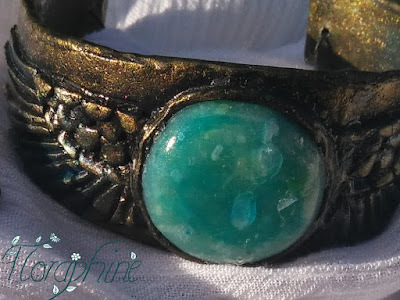 Create a bigger stone too for you bracelet. 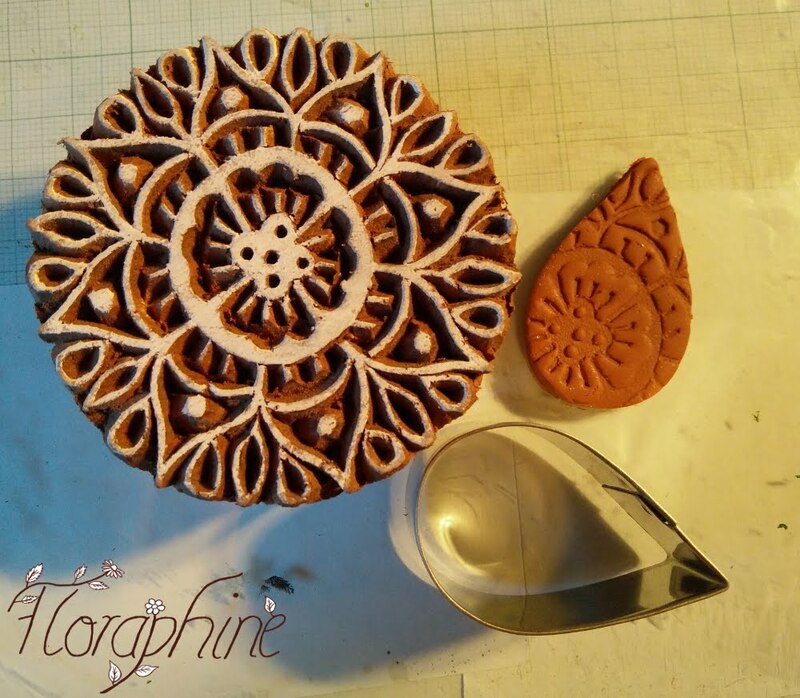 Choose a cookie cutter that has the right size, put some kitchen wrap on top of your clay sheet and then cut out the circle. This way the edges are already rounded. 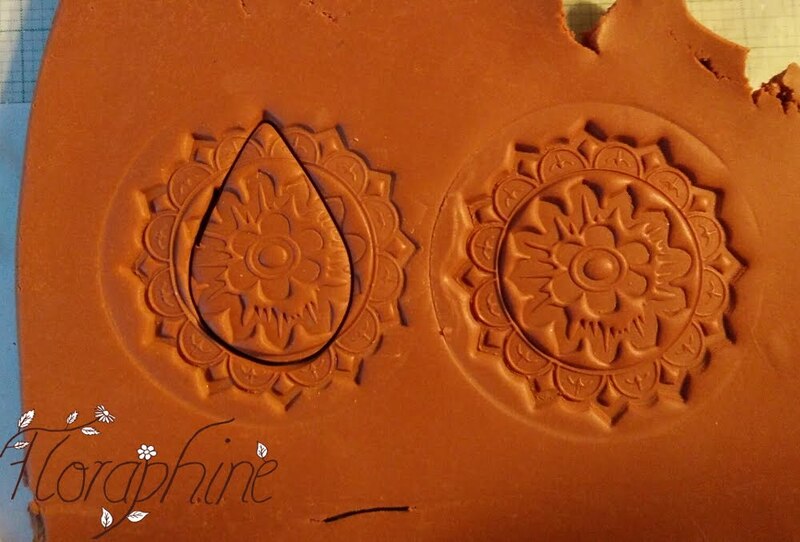 Place your thin sheet of translucent clay on top again, cut around the edges and smooth out any irregularities. Now you can bake the stones separately first (that's what I did) and throw them into iced water right after baking. This makes them more translucent. However, this way the the stones won't bend with the piece and therefore you might encounter problems once you bend your bracelet. I show you what I mean further on. Anyway, before you position your stone, consider texturing the bangle. Of course I forgot to do it and had to come back to it with the stone already in place. I recommend texturing by pressing in sandpaper as this gives it a really nice effect. Now place your stone in the centre of your bangle. To give it some more interest, you can cut a thin strip of clay and wrap it around the stone. I also did this with the smaller one on the necklace. 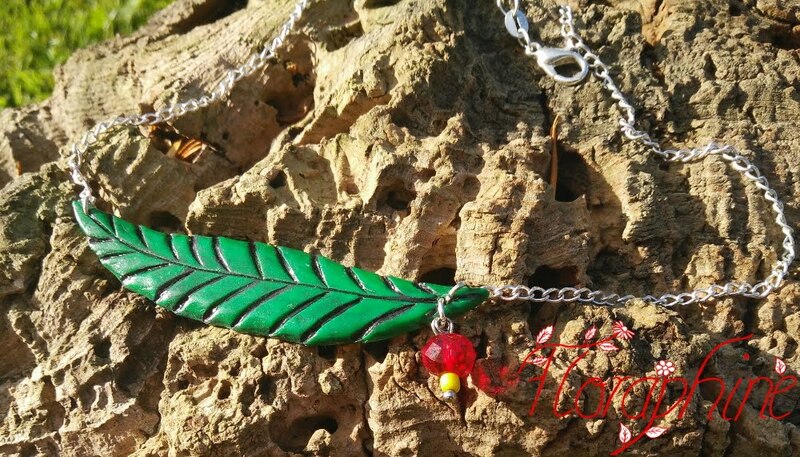 Now we'll create the same feather pattern as on the necklace. You might need to draw another rough template for this, as it will probably have a different size. 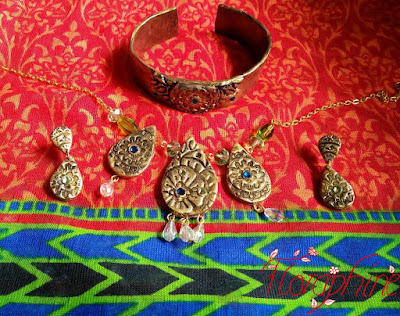 Then start arranging your feather shapes like you did on the necklace. Now onto the exciting part: the colouring. 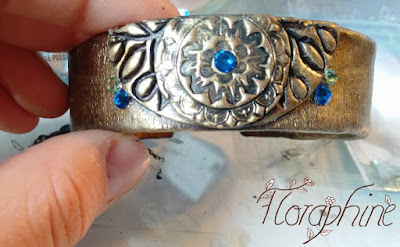 You can use metal powders, eye shadows or paint it later with acrylics. I used my golden metal powder first by dabbing it on lightly with my fingers. To have some colour, you can apply eye shadow in a shade corresponding to your stone. I recommend applying it with a brush to get into more spots. If it doesn't stick because you have already too much powder on there, you can use some liquid clay. 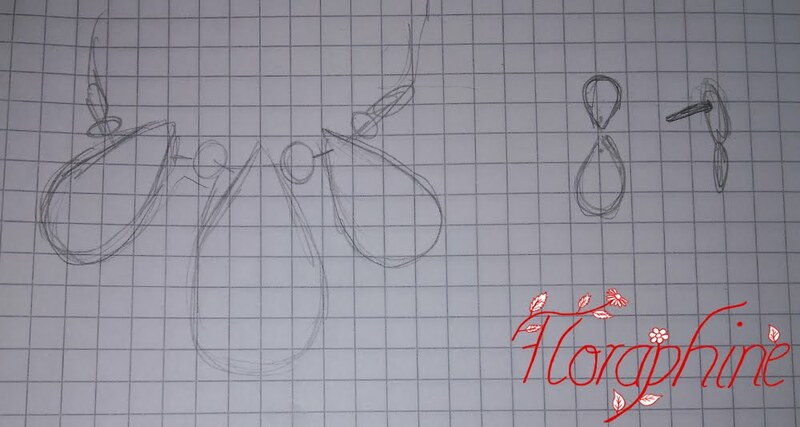 Don't forget to do the same with the necklace parts. Now remember when I told you, you might experience problems if you bake the stone in advance? 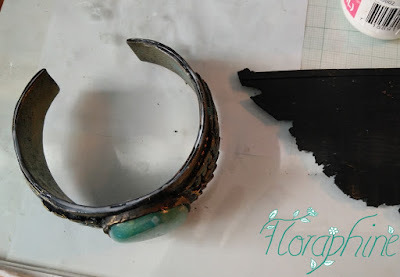 Well once I bent my bangle into shape and attached it to the metal base, I got some ugly gaps where the stone was attached to the raw clay because obviously it couldn't bend with the piece. I only noticed that after baking. You should keep this in mind. However, you can fix it of course. Roll out some more clay, stuff the gaps (liquid clay makes it easier), apply colour again and no one will notice. However, this will always stay a weak point. Once you have attached your outer part and cut any excess, I recommend baking it for 15 minutes so you don't distort the shape. 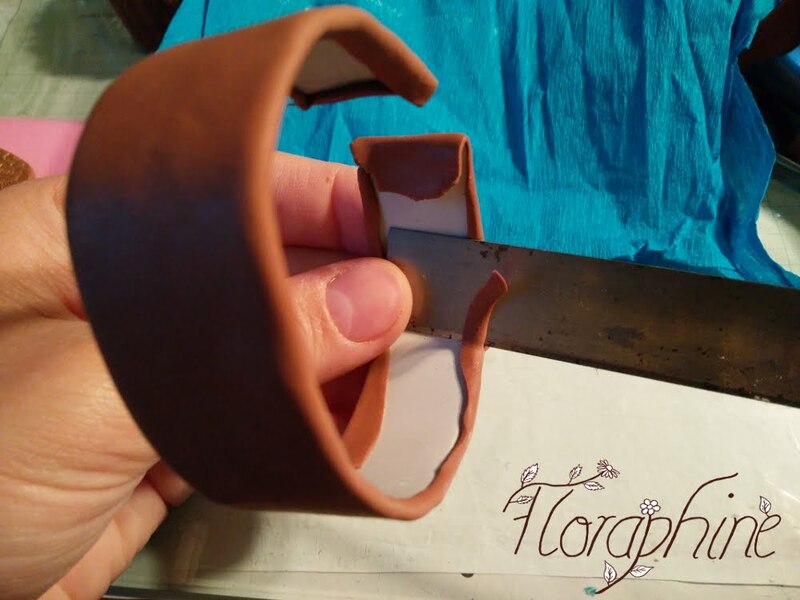 Then roll out some more clay and cut another bangle part using your template. Texture that and apply colour as before, then attach it to the inner side of the bangle. 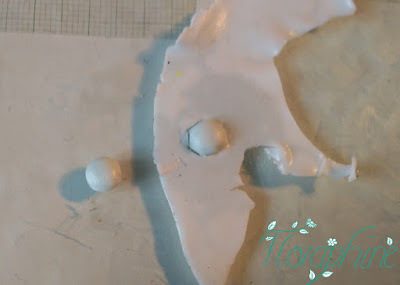 Cut any excess again and now you'll just need to hide the seams by cutting a thin strip of clay and attaching it all around with liquid clay. Cut any excess, smooth out the seams and don't forget your colouring. Bake one last time and it's finished. If you experience that the bangle sits to loose on your arm, you can screw some holes into the ends and add a chain and/ or a closure. That's what I did. 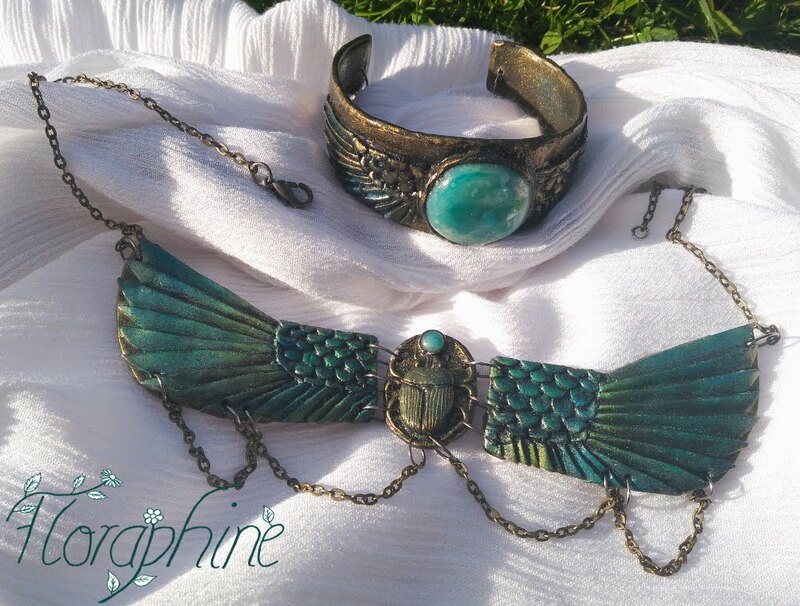 Now just add a piece of chain and closure to your necklace measuring it to fit your neck and the clothes you want to wear. You can also attach chain to the holes we made at the bottom. Always twist open a jump ring first (never pull it open!) and attach that together with your piece of chain. 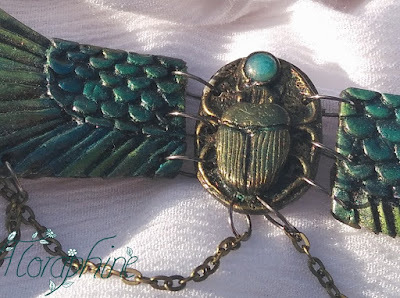 It's nice to use some graduated cutters to make the necklace from several pieces but you can of course just make one piece. Choose some nice stamps with ornaments to stamp into the clay. Of course you can also roll out very thin snakes of clay and create a design with those but it's much easier to stamp. 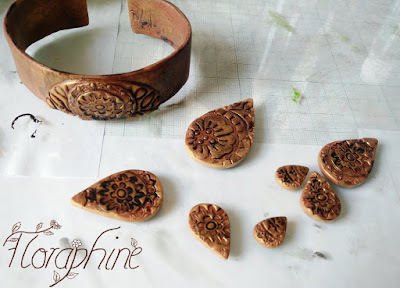 I have this set of wooden stamps which are meant for stamping on fabric and chose one of them for my central piece. 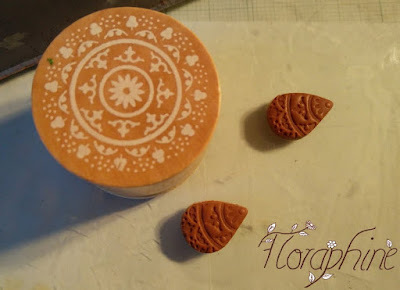 Roll out your clay of the colour of your choice (I chose brown which is easy to cover by gold) on the thickest setting of your pasta machine or by hand and press in your stamp. Some people roll over the stamp with a rolling pin but I found that it sometimes distorts the design. Therefore, I recommend either pressing with your hands (while standing) or putting a large heavy object on top and applying pressure to that. Then cut out your design where you like it best with your chosen cookie cutter or by hand. 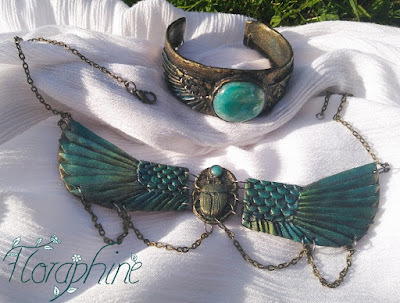 For the other two necklace pieces, I chose a smaller stamp and a smaller cutter, but of course that's personal preference. 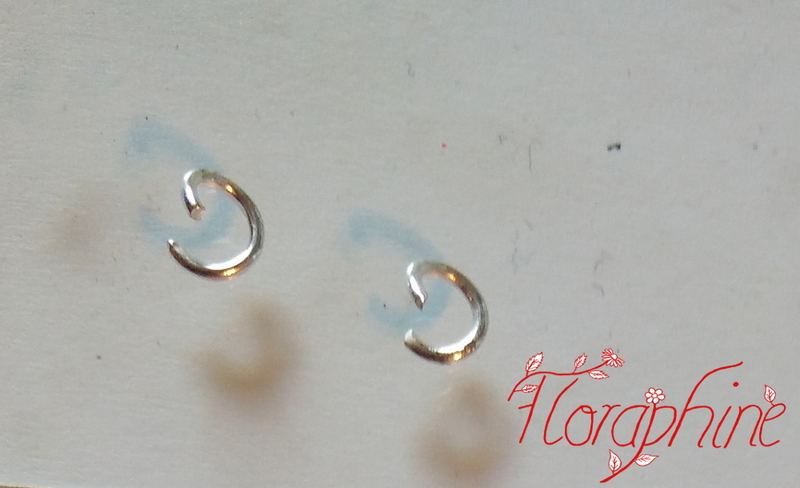 I also created two more (one size smaller ones) with this stamp for the dangling parts of the earrings. 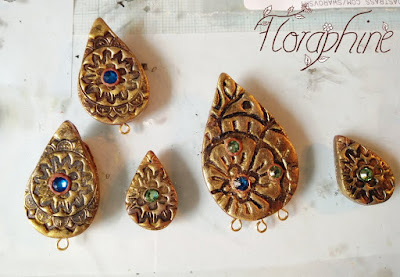 You can either decide to hang those earring pieces from ear hooks or make another piece for studs to go on. The picture below shows my pieces for the studs. Now onto preparing the bangle. Measure your arm and cut a strip of metal from a metal sheet. If you don't have one, you can also use an empty soda can but it might be too flexible. Bend it into a cuff, you can bend it around a glass if you have one with the right diameter. 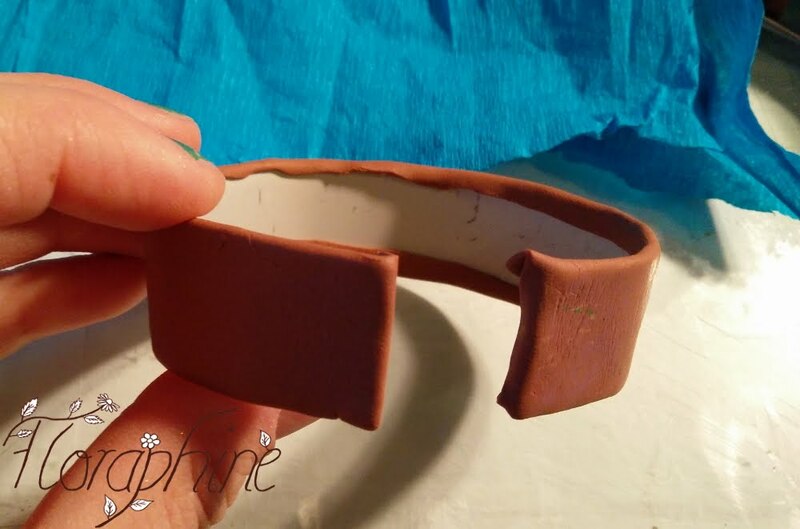 Roll out some more clay and cut a strip that is slightly bigger than your metal cuff. Texture it to make it more interesting. 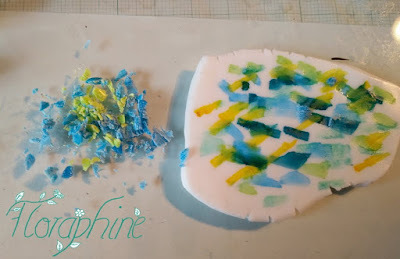 I used this crinkled up paper (not sure what it's called :D) and pressed it in for an interesting texture but you can use sandpaper, a toothbrush or anything you prefer. You can also make your bangle only from clay, if you roll it out thick enough. But I'm always worried that it breaks if you use it. 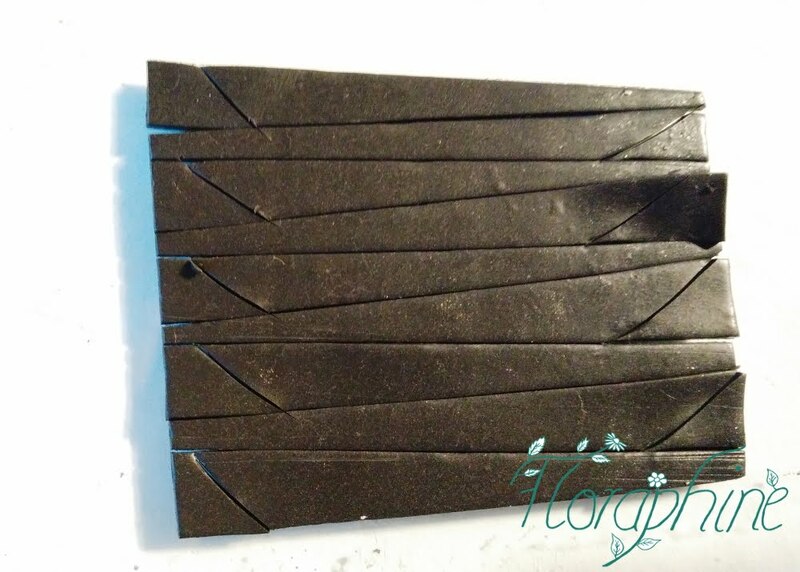 Place your clay strip onto your metal piece and attach it with the help of liquid clay. Smooth it down from the middle to the outside thoroughly to avoid air bubbles that will show after baking. Wrap the overhang around the sides. Shave away the excess clay on the inside with your blade. Cover all of the pieces you made with gold powder and then pre-bake them for about 10 min. Of course you can also paint them with gold acrylics later. 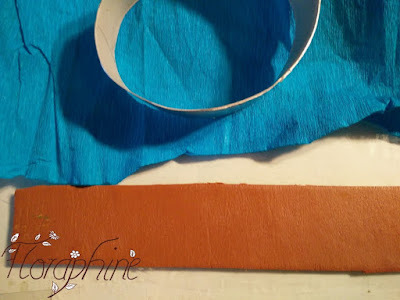 To finish of the bangle, take another sheet of clay and texture it. 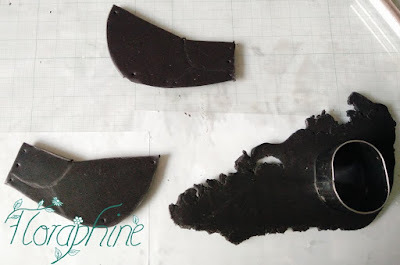 Attach it to the inside with liquid clay and shave of the excess clay again. Smooth out any seams and apply gold powder. 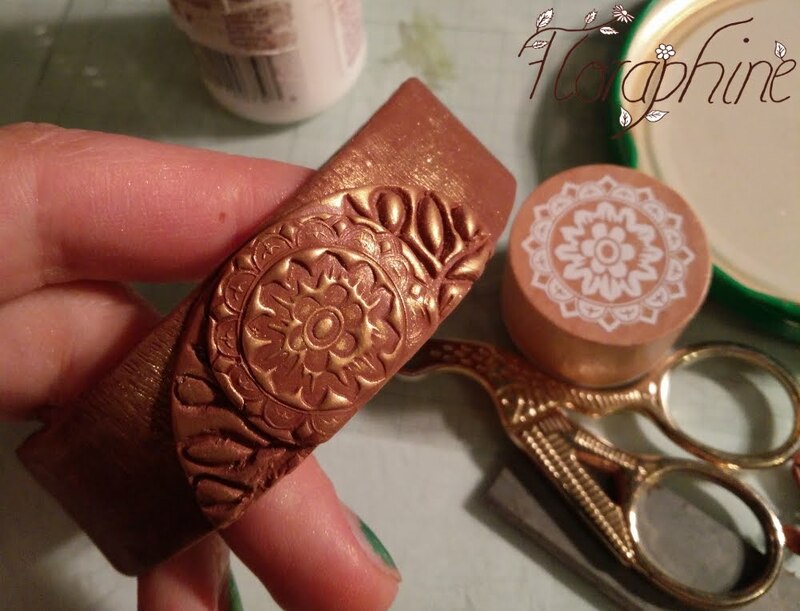 To make a design on the bangle I used my big and small stamps from above again and cut them out with round cookie cutters. Put on the larger circle with liquid clay underneath and the small one on top. Cut any excess and apply gold powder. 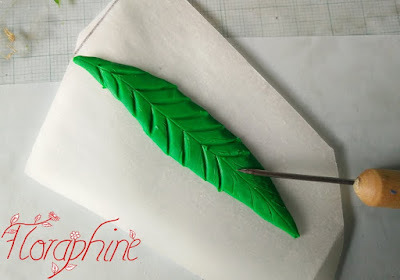 Tip: you can also cut clay with small scissors (like mine in the picture) which often works better than using a knife. 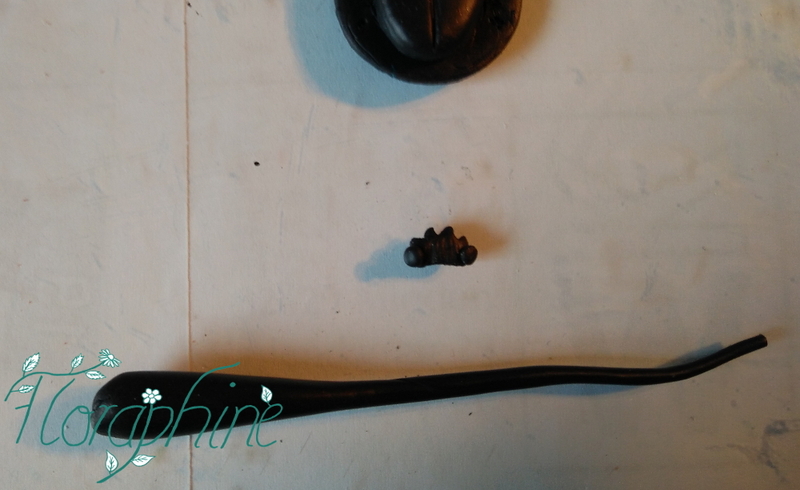 If you want you can antique your pieces by brushing on watered down black paint and wiping away the excess with a tissue. Once your pieces are out of the oven you can turn to their back to be able to hang them. Of course you can just poke holes into the front before or after baking but I think it looks nicer if you have the eye-pins at the sides. You can also hang some beads from your pieces. To recreate my look, take some eye-pins and bend them like in the picture. This way they won't fall out after baking. Place them where you want your beads to hang, like one in the middle and two next to it. Then roll out some more clay, texture it as before, cut the same shapes as your already baked pieces, apply liquid clay to the baked clay and place your raw pieces on top to cover the eye-pins. 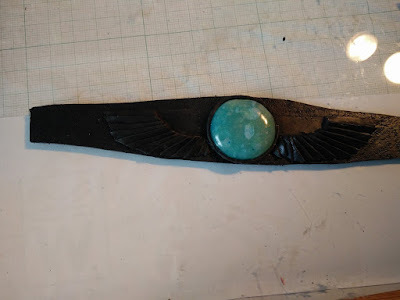 Don't make the clay too thin otherwise, you'll have bumps where the eye-pins are, like I do (but it's on the back and I'm not selling it so I didn't mind). Here I also sandwiched a toothpick in between the layers because initially I wanted to string the pieces on cord. However, if you want to use chain, I recommend embedding another set of eye-pins on either side. 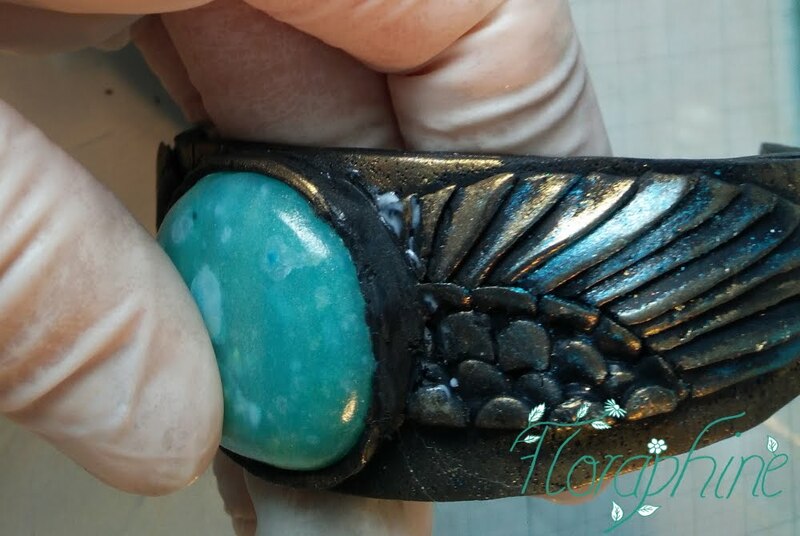 If you have any excess at the sides, cut it off and don't forget to apply gold powder again at the back and the sides (or paint it after baking). If you want to make studs, you'll have to securely embed the metal (or plastic) piece into the clay. Here you can see the baked piece of clay in the same shape. Poke your stud through. Apply liquid clay to the baked part and stick the raw piece on top, pressing it down really well to help it adhere. You can also glue the stud on after baking but this way it looks neater and is more secure. Shave away any excess you may have at the sides and apply gold powder again. Bake all of your pieces again. After everything is painted to your liking, you can add some crystals. 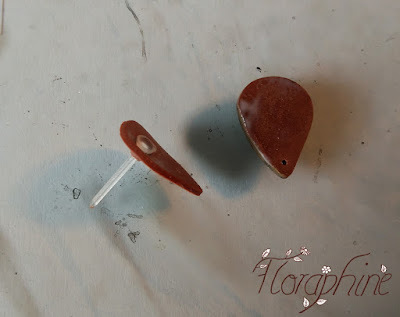 If you have any with a hot fix back, you can also do this before and simply bake them together with your pieces. Otherwise, just glue them on now in areas that look nice. Use a very strong glue like e6000. I used 3 blue and 2 green ones for my bangle. Here are the other parts. The smallest ones are going to be earrings, the other three are for the necklace. I wasn't sure if the glue was really enough, so I added very thin snakes of clay around the crystals just to be sure. You can see the difference in colour on the photo. I then brushed on some more gold powder. Now onto assembling everything. 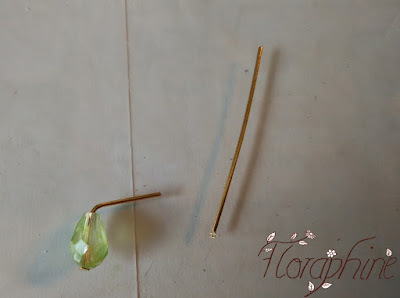 Put some pretty beads, like the teardrop-shaped crystal beads I used, on head pins and bend a loop with your round-nose pliers. Cut away any excess. Bend open your loop with your pliers to attach it. Always twist sideways and don't pull! Otherwise you'd weaken the metal. Attach them to your pieces and then attach chain in the same way (or string them on cord). Add some beads in between and at the sides if you like. Assemble your earrings with jump rings and if you're scared of losing your cuff, you can also attach a piece of chain and a closure by drilling a hole at the ends and adding a jump ring. Underneath is the fabric of tunic I wore to the party. So what do you think?